Combinez la plongée en apnée dans la mer des Caraïbes à une aventure de natation cenote lors de cette visite de 6 heures au départ de Tulum. Descendez ensuite sous terre dans un cenote sacré où vous pourrez nager devant des formations calcaires. Cette excursion combinée dans la péninsule du Yucatan comprend le transport aller-retour pour le déjeuner et l’hôtel. This was my first time snorkeling and Luigi did a great job of taking us through what it would entail to make sure not only were we all safe, but saw some great stuff!!! He had an amazing amount of knowledge about Mexico and the eco systems. The cenote was like nothing I had ever experienced. This was a great deal for what you got! Hardly words for this one. It is remarkable to find a small hole in the jungle floor, descend a ladder with flashlight strapped to one's left wrist, and move in water through interlocking caves. This was a wonderful experience and not at all frightening. I found it deeply affecting to be in this subterranean world, and the scale is such that it is not overwhelming. I highly recommend it. The tour was incredible and I can't recommend enough. Luigi, our guide in Tulum by way of Italy, was kind and very knowledgable. The underground cave tour was something I'll never forget. Our family of 8 adults took this tour on December 22, 2017. We had the tour of a lifetime. It was fantastic and truly beautiful! Tania was a wonderful tour guide. She is extremely knowledgeable of the history of the Cenotes and by the end of the tour we felt like she was a part of our family. We would highly recommend this tour. Great tour with a lovely guide who was knowledgeable and friendly. Didn't see too many fish in the ocean snorkelling, but enjoyed every minute of the cave/ cenote tour. I loved this adventure! Swimming in Yal-ku Lagoon was a beautiful experience. 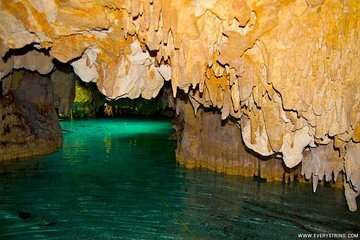 The mysterious walk inside the ancient limestone caves and the dip inside its crystal waters was simply magical. What made this tour so especially wonderful was the energetic guidance and passionate insight of our amazing tour guide, Pluma. His knowledge of Mayan culture and myth, his enthusiastic spirit along with his thoughtful concern with all tour participants' well being makes him the ultimate host and guide. He certainly enhanced my experience and I hope to have him as a tour guide when I visit Tulum again. Gracias Pluma!!! : P.S. I still need the recipe of the amazing vegan ceviche we were served. It was delicious!!! This was an amazing tour !! The snorkeling was good but the underground cave and Cenote was EXCELLENT !! The cave was very interesting and the home made food for lunch was great. Highly recommend this company and this excursion. What a fantastic day! The Lagoon was so beautiful I did not want to leave. Abundant tropical sea life on view. Then we walked into the Cenote and towards the end actually swam along the underground river and ended in a grotto. Our tour guide Alex was professional, friendly and knowledgeable. This was a wonderful tour. Our guide was knowledgeable, warm, and funny. Exploring the cave was fascinating, and swimming in the underground cenote was really cool. Lunch was tasty vegetarian tamales made locally. Snorkeling in the lagoon was fascinating. So many fish! But also it showed the difference between Mexico Kan tours small groups, respectful of our surroundings, knowledgeable tour guides and the large, rambunctious groups that were at the lagoon at the same time. We would definitely do more adventures with Mexico Kan tours next time we're in Tulum.